I’ve been making the most of the awesome spring weather over the last days and retrieved my road bike from the shed where it’s been hibernating for the last few months. I got home from work tonight and the car was still claiming a temperature of around 15 degrees in the sunshine so I jumped on the bike for a 14 mile loop round the back roads of Deeside. 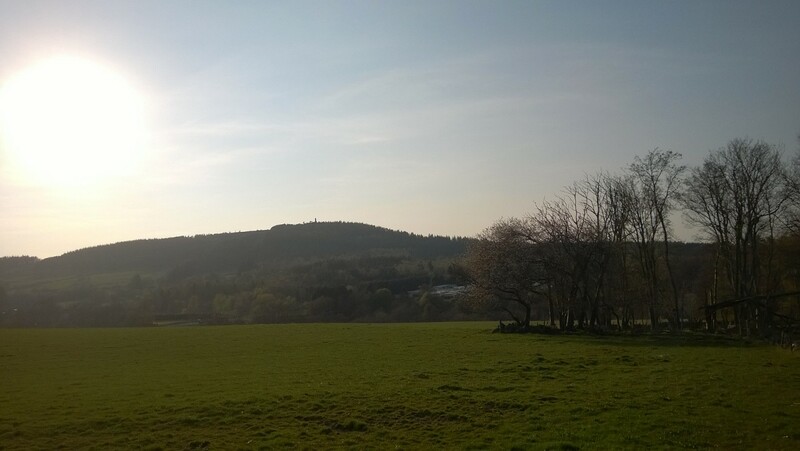 Normally if I take a picture of Banchory’s Scolty hill it’s from the top but cycling round the back roads gives you a great view from the west of the hill, especially when the sun’s shining in the early evening haze like it was tonight. This was one dish out of about eleven that I ate on Sunday night during the tasting session for my forthcoming wedding. This was roast loin of pork with mustard and sage stuffing. Don’t worry, I’m not giving anything away. While I loved this dish my fiance wasn’t a fan of the mustard stuffing so this one won’t be appearing on the final menu. Another quick post while I finish typing up last week’s trip to Edinburgh. Today was farmers market day and I had a good reason to head down to Scott Skinner Square anyway (needed a haircut) so took the opportunity to fill our freezer with meat. The guys at Dunnottar Wines and Spirits in Stonehaven have recently opened a 2nd shop in Banchory, called Deeside Drinks Emporium. Located on Dee Street, across from Bellview car park, they’re still not fully up to speed but they do have a fine selection of wine, whisky and some beer. Personally I think this is something that’s been sorely lacking in Banchory and I expect it’s arrival could prove quite expensive for me in the future! I popped in for a look today and came away with a bargain in a bottle of 18 year old Fettercairn from independent bottlers Gordon and MacPhail, and a few interesting beers – a raspberry beer, a black double pale ale from Brewdog, a single hop ale with elderflower and a pale ale from Orkney. I’m really looking forward to opening them!